A Sherwood teen took third place in countywide art contest with over 50 entries. Creating art has been important to Jasmine McCleskey for "my whole life," said the 16-year-old Sherwood resident. Music and books also are passions for McCleskey — her grandfather was a musician in the Oregon Symphony, and she enjoys reading fantasy novels like J.R.R. Tolkien's "The Fellowship of the Ring." So it made senses for McCleskey, who is homeschooled, to enter this year's Washington County Cooperative Library Services summer reading art contest. This year's theme: "Libraries Rock!" "I always thought that art and music go really well together, and I absolutely love the library," she said. "So I thought that was a really cool trio to put together." 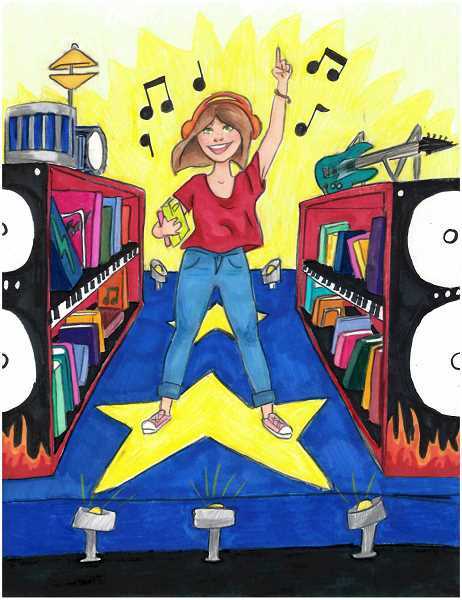 The contest accepts submissions from kids all over Washington County, and exists to find promotional art for the library service's annual summer reading program. Out of 56 entries, McCleskey's placed third. Her win marks the first time a Sherwood submission placed in the contest, said Adrienne Doman Calkins, the Sherwood Public Library's manager. "This year was the first year it was online submissions, which made the number of submissions explode," Doman Calkins said. "We're all so excited that someone in Sherwood came in third." "It felt pretty good," McCleskey said about placing in the contest. "I was surprised that I placed — it was a pleasant surprise." McCleskey has aspirations of becoming an art teacher so she can share her passion with others. In the meantime, she plans to participate in the library service's summer reading program again this summer. "It gets teenagers and kids my age to just read a book," she said about the program. "There's so much video gaming and kids staying inside all summer, and I think it's important to keep that reading process."